This post is sponsored by Juvela. Sometimes nothing beats a fish finger sandwich, but it’s not always the healthiest meal. That’s where you need my gluten free cod goujons and homemade tartare sauce! It’s a healthier version of a classic recipe, and makes the best ‘posh’ gluten free fish finger sandwich around. When Juvela asked me to come up with a healthy gluten free lunch idea, I knew it was finally time to try my hand at making gluten free fish goujons. I absolutely love breadcrumbed food but sadly those beige-coloured treats aren’t always that good for you. But because these goujons are baked and not fried, they’re tasty and crispy without any of the deep-frying. I also decided to make my own tartare sauce with this recipe, because let’s face it, nothing goes better with a fish goujon than this! I never actually knew what went into tartare sauce but it turns out it’s pretty simple – just mayonnaise, gherkins and capers. It’s really interesting when you create a recipe and find out exactly what goes into you food. Turns out making your own tartare sauce tastes so much better too! And if course the only way to eat this all is in a gluten free sandwich! 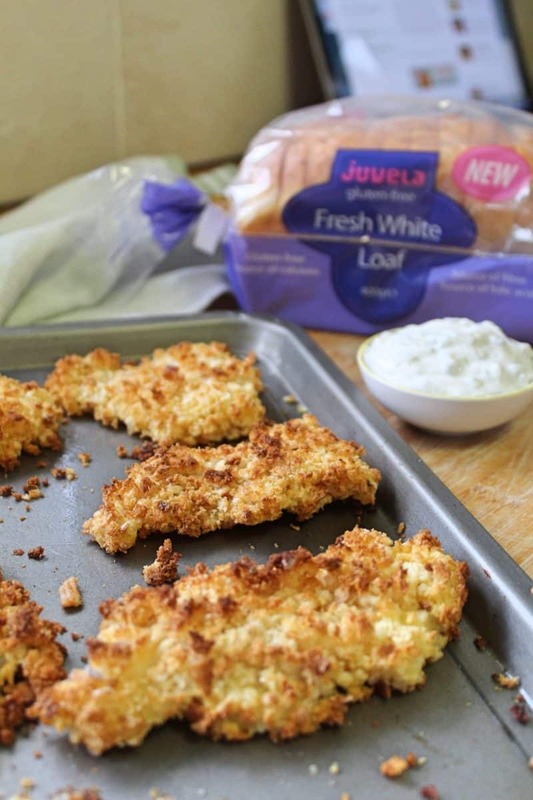 I love Juvela bread because it tastes good out of the pack – no need to toast it, although you can if you like. 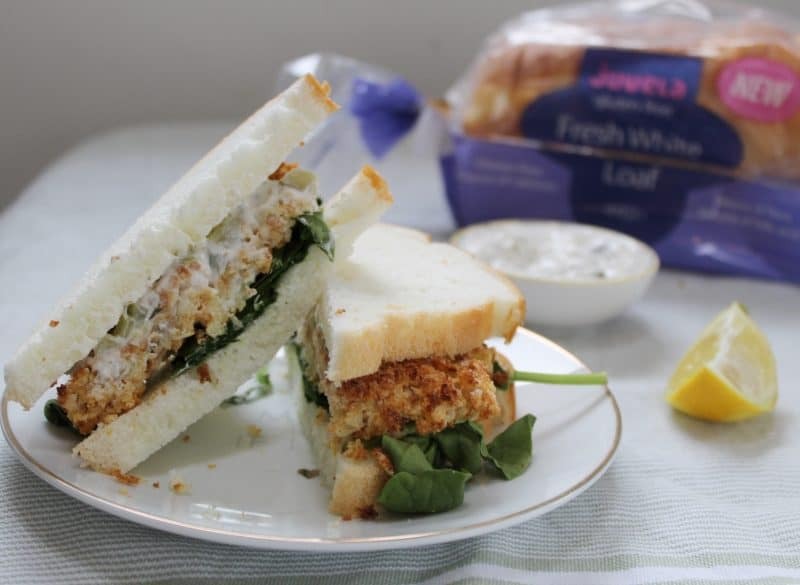 Serve up your gluten free fish finger sandwiches with some fresh green spinach and a squeeze of lemon for the perfect lunch. To get my gluten free fish goujons looking super golden and tasty, I baked the bread a little before turning it into breadcrumbs. Remove it from the oven as it turns golden brown and the breadcrumbs will have a lovely colour to them! When coating the fish, I added a layer of gluten free flour (I used the Juvela white mix which you can get on prescription, but any plain gluten free flour will do) and then the breadcrumbs. I find the egg and flour help to create a kind of glue which makes the breadcrumbs stick really well. Make sure you press them into the fish as well to ensure a nice even coating. Adding lemon and pepper to the breadcrumb coating was also a great choice. It adds a really subtle flavour, as white fish can be a little bland at times, and was just delicious with the tartare sauce. Now I’ve nailed this recipe, it’s certainly one I’ll be coming back to time and time again. 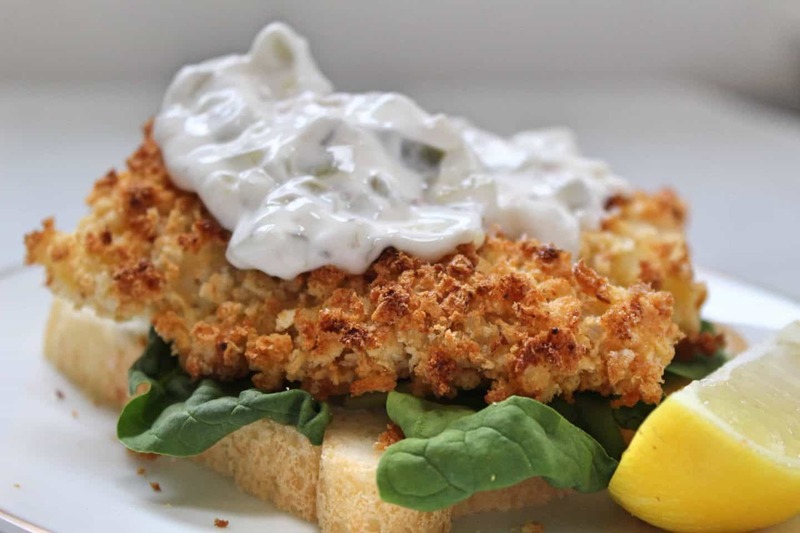 My gluten free fish goujons with lemon and pepper are perfect paired with homemade tartare sauce, sandwiched between fluffy white slices of Juvela gluten free bread. Preheat the oven to 200'C. Place the slices of gluten free bread on a baking tray and bake for 5-7 minutes until golden. Break up the bread and add to a blender with the lemon zest and a good helping of salt and pepper. Blend until breadcrumbed. Pour onto a large plate. Pour the flour onto a second plate, and the beaten egg onto a third plate and set aside. Grease a baking tray with the olive oil. Chop the cod fillet into pieces of your chosen size, and then coat each bit in the egg, then flour, then egg again, the bread crumbs. Really press the breadcrumbs into the cod, then lay the pieces on the baking tray. Once they're all done, bake in the oven for 15 minutes. Mix the mayo, gherkins and capers in a bowl. 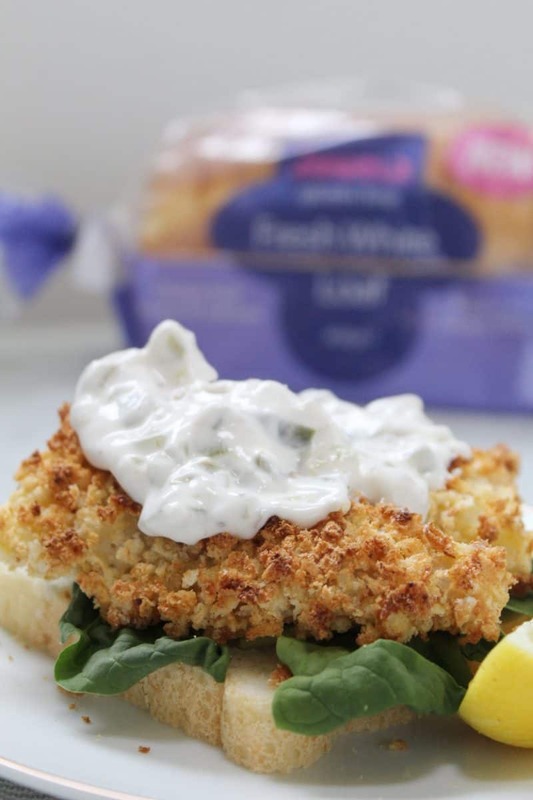 Once the fish is cooked, lay two pieces on a slice of gluten free bread and some spinach leaves, top with a dollop of the sauce and a squeeze of lemon, and then sandwich with another piece of bread on top. Enjoy hot. Need some more gluten free meal inspiration? If this recipe has got your tastebuds flowing and you want some more meal inspiration, check out some of my other gluten free recipes!